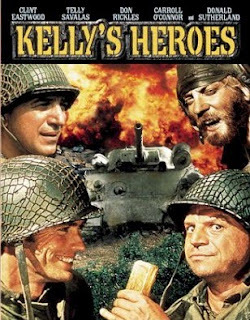 The first film I watched this week was Kelly's Heroes. In my opinion, this was one of Clint Eastwood's best films, however the main reason I watched it again is because of Donald Sutherland's role as the alcoholic hippy tank driver - "Oddball". The film was released in 1970. The main plot is based around a storage of gold in a bank in France, which is being "secretly" guarded by the Germans. It is not that secret, as a group of US soldiers, led by Clint Eastwood or 'Pvt Kelly' know about it and plan to steal it . These soldiers go against orders to capture the gold for themselves, drafting in various help along the way. I've included a link to the best scene below. Where Eastwood, Sutherland and their sergeant have a western high-noon style stand-off with a fully armed German tiger tank. Well worth a watch. The hippy 70s soundtrack to this film is also great. After watching Inglourious Basterds a couple of weeks ago, I immeadiately picked up on the music in the film being very similar at points, after a quick check, turned out it shared a composer with Kelly's Heroes.